They are now 3-0-1 away from home. I'm not sure how coughing up a 5-1 lead to 5-4 is boring. One cheer to J.M. Rizk for breaking into the goal scoring column with two over the weekend. Two cheers for Beauregard for his four goals this weekend. 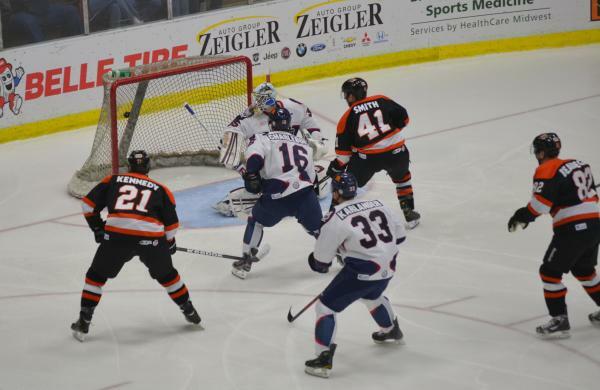 Three cheers for the Komets winning weekend. Two game against division foes on the road. Michael Franke was on Jim Shovlin's show on Saturday and informed the radio audience that on Monday there would be a huge announcement. Is that announcement the same one Bob Chase was broadcasting all weekend regarding Mike Emrick? Even 1380 A.M. had a recorded announcement about it right before it was Franke's turn on the show. Speaking of Mr. Chase, what happened during the Toledo game, when he announced a goal (which was, in fact, disallowed, but wasn't communicated to the radio audience and continued to give the incorrect score for the rest of the period? C'mon, allyou gotta do is glance at the scoreboard every now and then. Finally, please, before you go on the air, make sure you have the opposing team's nickname correct. All night long it was the Walleyes, not the Walleye. I know I sound sort of sacrilegious criticizing Bob Chase, but when listening to the radio, his eyes are my only way to know what is going on. Speaking of Kalamazoo,( well maybe I wasn't,) but those wonderful upgrades they made to Wing's Stadium sure are being viewed by a lot of empty seats. .
Talking with a few Wings fans on Saturday while I was up there, seems that many people weren't aware of the time change of the game. Tickets were printed with 7pm originally. Only the diehards were in attendance. It was still a terrible crowd. I seen more at Motor City Mechanic games. I think the Komet fans might have outnumbered with Kalamazoo fans. Lil DAB plays a lot like his big brother. I'm guessing dad worked a lot with them on shooting when he had them out on the pond. Double Edged sword. Brittian had a strong game despite getting tossed for 10 mins for his honest assessment of the referee's skillset. Thanks, JM. I looked up the attendance for Kalamazoo on the ECHL site and it was somethng between 2800 and 2900. They can't be very happy with the attendance that low. It was near the bottom of the league with maybe only five teams with worst numbers.